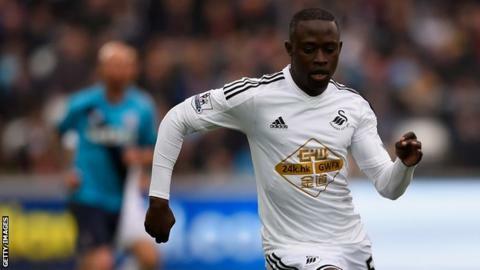 Swansea City forward Modou Barrow has been named in The Gambia squad to face Mauritania in this month's 2017 Africa Cup of Nations qualifiers. Barrow, 23, made his debut in the 0-0 draw against South Africa in June. But he missed the 2018 World Cup qualifying elimination by Namibia because of his club engagements. "It's good to be back and give 100% to the Gambia. We'll go there and play without any pressure because we have got a good team," he told BBC Sport. Rhyl FC defender Ibou Touray, who plays in the Welsh Premier League, is also named in the squad. Barrow, who became the first Gambian to score in the English Premier League in Swansea's 3-2 defeat at Bournemouth, added: "I hope the nation supports the coach." Coach Sang Ndong has also recalled Leeds United's Mustapha Carayol, who appeared once for the Scorpions in a friendly with Uganda. Ebrima Sohna, Abdoulie Mansally, Sanna Nyassi and Ousman Jallow have been overlooked whilst FC Sion's Pa Modou Jagne withdrew because of injuries but six local based players have been included. The Scorpions who sit third in Group M with one point from their two outings will travel to Nouakchott to face the Mauritania on 25 March before hosting the return leg in Bakau four days later. Forwards: Muhammed Conteh (Mbour Petit Cote, Senegal), Demba Savage (Hacken, Sweden), Omar Jagne (Dalkurd, Sweden), Pa Amat Dibba (GIF Sundsvall, Sweden), Emil Sambou (Armed Forces, Gambia).